To be able to see like this! This is a very advanced form of seeing. 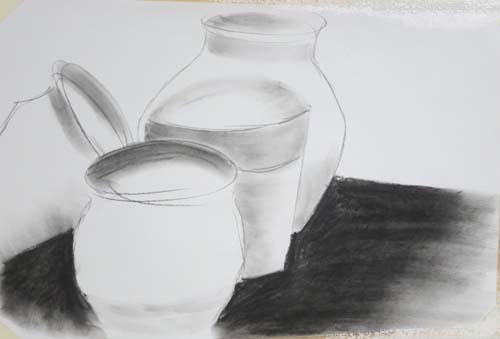 It’s not about documenting the shape of the pots. The photo does that. It’s not about proving that you’re diligent, that you put in the time and now you’ll price the drawing according to the time you slaved over the drawing. There are people who think like that. So master-servant 16th century. And if you think your five-year-old can do this, well, you need to come to class. What makes the drawing so great is the form. Not the shape of the pots. The form of the drawing! Seeing form is like reading between the lines in a story, reading deeper than the narrative. It’s seeing through the shapes, seeing deeper than what’s illustrated. The artist here is not illustrating pots. She is creating a page that stands on its own. 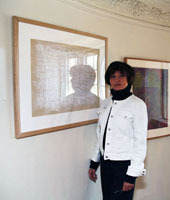 She creates a tug between positive and negative space. 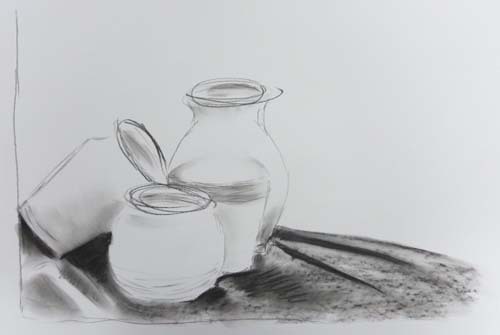 We expect the pots, being graspable things, to hold our attention. The ground they stand on is supposed to just passively support objects. But notice that the shape of the ground is more emphatically articulated than the objects. It’s dark and has a stepped shape of its own. 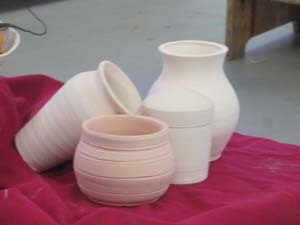 The shape of the pots is predictable and our expectation projects more information into them that is actually given. Even though they are presented in casual curves and ellipses, we read them clearly. We as viewers are engaged in completing the presentation. A good thing. We also notice that the whole page is a dialogue between the severe,angular, rational edge of the black ground and the curved, flamboyant, irrational lines of the identifiable objects. So good. Back to the sketch idea. The drawing, above, was preceded by a more elaborate working out of this motif. The artist put in some folds of the cloth that covered the table. In other words, details. This is also an interesting drawing, but not as exciting as the one featured here. The artist had to wrestle with details, with the impulse to represent more literally what she actually saw, to attain the view of form that marks the stark drama of the final drawing.